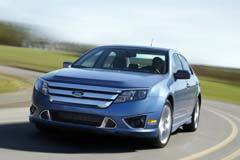 In 2006 the Ford Fusion was added to the lineup of the car maker’s sedans. Engineered at a plant in Mexico, the Fusion was designed using the platform created for the Mazda 6. The Fusion allowed Ford to unveil a more modern style with a chrome grille and projector beam headlights highlighting the vehicles frame. The first generation of the Fusion was initially only offered in front wheel drive. With three trim levels, the sedan came equipped with 2.3 liter engine capable of producing 160 hp. However, the early models of the Fusion were not particularly powerful and lacked in fuel efficiency. The second generation Fusion was introduced in 2010 and succeeded in making changes where necessary to the first model. The styling was upgraded and four trims were now offered. There was now the choice of a Sport option and a powerful V6 engine. In addition, upgraded technology was added with SYNC as option for certain trims. A used Ford Fusion is well equipped and the second generation is a popular buy amongst people looking for a family sized sedan. However, earlier models are limited in engine power and rank low in gas mileage among similar sedans in its class. 2019 Fusion S 2019 Ford Fusion, Gray with 11 Miles available now!